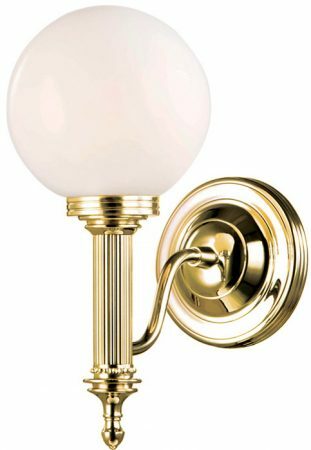 Part of the Carroll traditional solid cast brass bathroom lighting range from Elstead Lighting. Highest quality Edwardian style bathroom wall light, with a circular solid cast polished brass wall bracket and double curved lamp arm. The ribbed candlestick arm is finished with a detailed finial and supports a globe glass shade. Rated IP44 and supplied with a dimmable halogen lamp, this quality bathroom light is a perfect addition to a more traditional styled bathroom.